The Lyra Direct C. difficile Assay is a qualitative, multiplexed in vitro diagnostic test for the detection of toxin A gene (tcdA) or toxin B gene (tcdB) sequences of toxigenic strains of Clostridium difficile from unformed (liquid or soft) stool specimens collected from patients suspected of having Clostridium difficile-Associated Disease (CDAD). A multiplex real-time PCR reaction is performed under optimized conditions in a single well generating amplicons for each of the targets present in the sample. Identification occurs by the use of oligonucleotide primers and probes that are complementary to conserved regions in the tcdA and tcdB genes of the pathogenicity locus. The Lyra Direct C. difficile Assay has one-step reagent set-up and a three-step sample prep. Test results are available in less than 70 minutes. 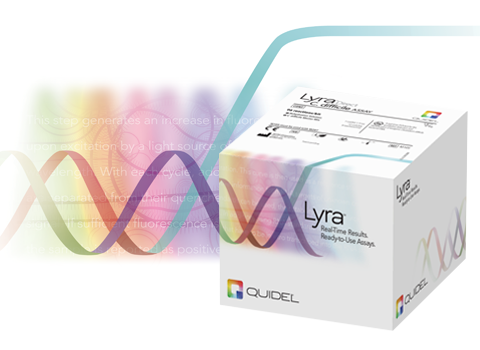 Lyra Direct C. difficile is a quality real-time PCR available for use on Applied Biosystems® 7500 Fast Dx Real-Time PCR Instrument, QuantStudioTM Dx Real-Time PCR Instrument and Cepheid® SmartCycler® II. The Lyra Direct C. difficile test is one in a growing menu of real-time PCR assays and intended to aid in the diagnosis of CDAD in humans.